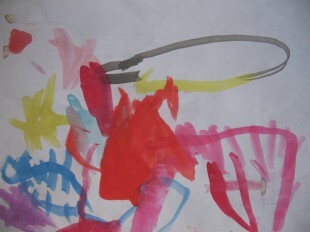 As I sat down to paint with my three year old the other day, a great shift had taken place in her sensibility. Circles, lines and shapes were appearing, where only scribbles existed last week. Seemingly effortlessly, her hand would create groupings of abstract shapes and lines, color was chosen with ease. As quickly as she started, she was finished. Unattached to her final product, she pushed the piece aside and was on to the next. How exciting, this new found shift in creative ability, how easily it had come. Earlier this same day I had been working on a painting of my own. Struggling with color choice, line placement, and overall composition, I left my piece feeling frustrated and defeated. It had been a while since I had experienced such angst from “painter’s block”. Learning to paint may come easily to some, but not to me. Not as an adult anyway. As a freshman in college, I decided to change majors from photography to painting. I had no idea what I had begun. It seemed simple enough in my mind, romantic even. That was 17 years ago, and I am still in awe of all I have to learn. This experience I had with my daughter reminded me of the seamless way in which a child transfers creative energy into practice. Be it drawing, dancing, or singing, the uninhibited creative child is a thing of beauty. A thing to behold. A thing to befriend and treasure through life’s journey. I did once paint with this ease too. It was before I learned how. When I was a child.